MOORESVILLE, N.C. - Team Penske announced Tuesday that 2012 NASCAR Cup Series champion Brad Keselowski has signed a contract extension to remain driver of the No. 2 Ford Fusion. 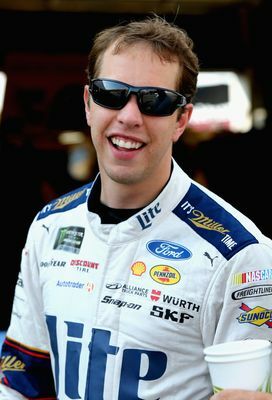 In a press release, Penske said Keselowski agreed to a multi-year contract that will allow him to stay with the driver "well into the future." Crew chief Paul Wolfe also agreed to a multi-year extension with Team Penske. "In the time that Brad has driven for Team Penske, he has risen to the top echelon of stars in NASCAR," said team owner Roger Penske. "Brad and Paul have established a terrific, winning combination and they are both real leaders within our team. More than just wins and championships, Brad is an important part of our relationship with Ford Performance and this work with the Checkered Flag Foundation shows what kind of person he is away from the track. There is no question he continues to be a great fit for our organization." Keselowski's teammate, Joey Logano, signed an extension prior to this season that will keep him behind the wheel of the No. 22 Ford through at least 2022, giving Penske a potent combination for many years to come. "Roger and everyone at Team Penske have given me everything we need to win championships at the highest levels of NASCAR," Keselowski said in a statement. "As I have said all along, Team Penske is where I want to be and I am thrilled to continue with the organization well into the future. I have a lot of years left in the sport and I truly feel our best years are ahead of us." Keselowski has 23 career wins in NASCAR's Cup Series, with 22 of those coming behind the wheel of the No. 2 car. In addition to his Cup success, Keselowski captured the NASCAR Xfinity Series championship in 2010 for Team Penske, and has been a part of three owners' championships with the organization. He has 29 wins in the Xfinity Series with Penske. Keselowski's 23 career Cup wins ties him with Ricky Rudd for 33rd all-time in NASCAR history. He is one of only four drivers to win both a Cup Series and Xfinity Series championship in his career.